As the June 30 deadline for an Iran deal looms close, critics continue to press on. The Iran nuclear deal is U.S. President Barack Obama’s biggest foreign policy gamble, one that his administration has spent considerable political capital crafting and defending. But critics say the agreement is not tough enough and doesn’t hold Teheran’s feet to the fire. They argue that no deal is better than a bad deal. The Obama administration’s eagerness to declare success has given Iran the upper hand, they argue. Stirring the American pot are Saudi Arabia and Israel, who have used their influence on the U.S. Congress to raise questions. The deadline for reaching a final agreement is June 30, but reports suggest it may be extended. A framework agreement, which broadly says that Iran will restrict its nuclear programme in exchange for the lifting of sanctions, was crafted in April, leaving the details to be worked out over the next three months. Several hurdles remain over how much access Iran would allow to international inspectors to ascertain the state of its nuclear programme. Iran has said military sites are off limits, something the critics have seized upon as a sign of Teheran’s games, although it appears the hard line may be a negotiating tactic. Senator Bob Corker, a Republican and chair of the Senate Foreign Relations Committee, wrote to Obama last week saying the U.S. should be willing to walk away from negotiations unless Iran allows “anytime, anywhere” inspections of all nuclear sites. “Walking away from a bad deal at this point would take courage, but it would be the best thing for the United States, the region and the world,” Corker wrote. He was the architect of a law passed recently giving the U.S. Congress the right to review the final deal before sanctions can be lifted. Other critics include Senator Marco Rubio of Florida, a Republican presidential candidate, who has used the Iran deal to tar Obama’s foreign policy record. Calling the preliminary agreement “very troubling,” he questioned why Teheran was being allowed to keep thousands of centrifuges. Besides, the deal does nothing to curtail Iran’s ballistic missile programme. There is no doubt that even if the deal is finalised in the coming days, Obama will face an uphill battle in the U.S. Congress before sanctions can be lifted. Latest reports say the U.S. and its partners (China, Russia, France, Britain, and Germany) are inching towards an agreement with Iran given that both sides have staked so much on success. Signs of compromise can be detected—Iran may allow inspection of military sites while the U.S. may not insist on a complete investigation of Teheran’s past research, which many experts believe was geared towards making a nuclear weapon. If true, both moves are major concessions, and something that hardliners in both countries are likely to seize. The Investor’s Business Daily, a right-wing business weekly, has called it a “hemorrhage of concessions” by Obama, saying he was fixated on getting the deal. The nuclear deal is just as important for Iranian President Hassan Rouhani as it is for Obama. For Rouhani, failure means political obscurity and ultimately an end to his career. Reports say that supreme leader, Ayatollah Khamenei, although a hardliner, supports the nuclear agreement. 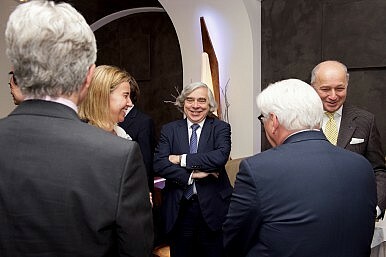 The negotiations started nearly two years ago in Vienna to end the nuclear stalemate between Iran and the West. Through the years, UN-mandated sanctions have seriously affected Iran’s economy as western countries pressured all its partners to stop buying Iranian oil. If the two sides succeed in the coming days and the sanctions are lifted—two very big “ifs” —the game in the Middle East will change. Seema Sirohi is a Washington-based analyst and a frequent contributor to Gateway House: Indian Council on Global Relations. Seema is also on Twitter, and her handle is @seemasirohi. This article was originally published at Gateway House: Indian Council on Global Relations, a foreign policy think tank in Mumbai, India, established to engage India’s leading corporations and individuals in debate and scholarship on India’s foreign policy and the nation’s role in global affairs. European companies should not rush to pour money into Iran's industries.